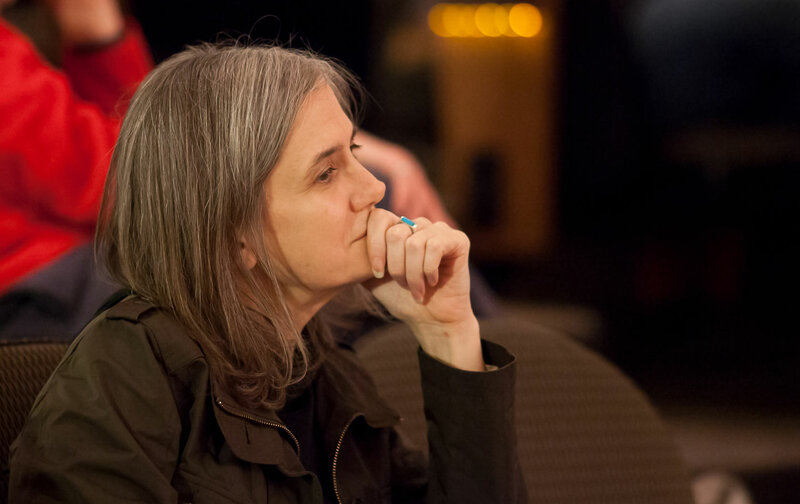 Amy Goodman Is Facing Jail Time for Reporting on the Dakota Access Pipeline. That Should Scare Us All. The charges against Goodman are a clear attack on journalism and freedom of the press. This Monday morning, shortly after the sun rises over the small city of Mandan, North Dakota, the award-winning journalist, and host of Democracy Now!, Amy Goodman will walk into the Morton County–Mandan Combined Law Enforcement and Corrections Center and turn herself in to the local authorities. Her crime: good, unflinching journalism. Goodman captured the scene as protesters were confronted by private security contractors wielding attack dogs and pepper spray. Goodman’s arrival at the main protest site was significant. At the time, not a single one of the major American broadcast networks (ABC, CBS, NBC) had sent a reporter to cover the Standing Rock mobilization; none had even bothered to mention it on the air. But there was Goodman, standing at the edge of a grassy plain that was in the process of being churned into gullies of dirt, reporting on one of the most significant stories of the day. Clutching a large microphone, she captured the scene as hundreds of protesters tried desperately to stop a crew of bulldozers from tearing up the earth—the earth, they said, that belongs to nobody—only to be confronted by a force of private security contractors wielding attack dogs and pepper spray. As Goodman narrated, a security contractor, burly in a deep blue shirt, could be seen belly-flopping a man onto the ground. Protesters streamed in to help him, stumbled over mounds of newly churned dirt, faced off with contractors whose faces were hidden behind oversized sunglasses. The scene was full of movement. Overhead, a helicopter hovered, circled, while back on the ground, protesters began to report burning eyes, and dogs—dogs lurching at protesters, dogs straining against their leashes, dogs with mouths open, mouths biting. Within hours of the attack, Democracy Now! had turned its footage into a seven-minute video that it released as a web exclusive. Three days later, Goodman followed up with an extensive report—“Dakota Access Pipeline Co. Attacks Native Americans with Dogs and Pepper Spray”—that she broadcast live on her show. The video quickly went viral, pinging across Twitter and Facebook (where it was viewed more than 14 million times) and landing, ultimately, on the same big news stations that, until that moment, hadn’t bothered to cover the protests: CNN, CBS, NBC, NPR. Goodman’s report created a rare crack in the consensus of silence. And, as Rolling Stone’s Matt Taibbi writes, the outrage it generated may well have influenced the Obama administration’s decision to halt work on the pipeline several days later. This was journalism that mattered. Yet, on September 8, Goodman received the news that Morton County, North Dakota, had issued a warrant for her arrest. The charge: riot, a misdemeanor punishable by jail time and a fine. It’s worth pausing here for a moment to contemplate the full and chilling absurdity of this statement: According to Erickson, a woman who appeared at a protest carrying a microphone emblazoned with the name Democracy Now! and trailing a video crew; who can be heard in the resulting video report identifying herself to a security guard as a reporter; and who then broadcast the video on the daily news program she has hosted for 20 years is not actually a journalist. She is not a journalist, because she harbors a strong perspective, and that perspective clashes with his own. By the same distorted logic, every muckraking news gatherer from Ida Tarbell and Upton Sinclair on through I.F. Stone, and, yes, today’s Matt Taibbi (whose work Erickson apparently admires) was not a journalist but an activist flirting with arrest. Goodman’s report on the attack on the pipeline protesters created a rare crack in the consensus of silence. This notion should disturb anyone who labors in the journalism trenches, particularly those who dedicate their days, and often nights, to covering stories that challenge the mighty and prick at the powerful. Engaging in serious journalism—journalism that captures a society’s forbidden, or simply hidden, stories—is hard and scary, and it requires bravery, conviction, and determination, along with an abiding faith in the protective power of the First Amendment. When that faith is compromised, the possibility of serious journalism collapses—a reason, no doubt, the Committee to Protect Journalists came out forcefully on Goodman’s behalf. Thus far, the North Dakota authorities remain committed to their own embarrassment; the charges have not been dropped, which is why Goodman is going back to North Dakota to turn herself in—and then fight the charges. A few weeks back, as I drove with Goodman to and from a memorial service (full disclosure: Goodman is a family friend whom I have known for a long time and once worked for), I overheard an admirer of hers ask what the public could do to support her as she faced arrest. Goodman was quick to respond: keep paying attention to the protesters in North Dakota, keep caring about their fight. She, in other words, was not the story. Note: This article has been updated to reflect the news that the charges against Goodman were switched from criminal trespassing to riot.